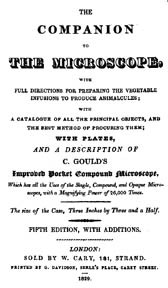 This page is devoted to the evolution and changes in the Gould Improved Pocket Microscope and Charles Gould's 'Companion to the Microscope...' and some related publications which also describe the microscope. 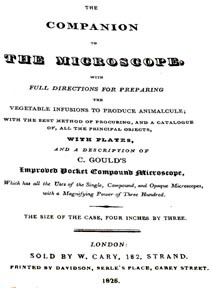 It also illustrates how Gould's books reflected changes in microscopy and even microtechnique over those years. A separate page details the components and accessories of the original 'Improved Compound Pocket Microscope'. This instrument, first produced by W. Cary sometime during or before 1825, was to become not only one of the most popular inexpensive microscopes of the time, but also one of the most copied. Many variations likely grew from this 'Cary-Gould' pattern. 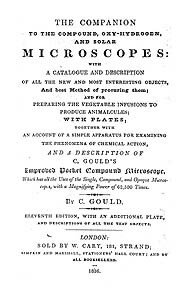 As Joe Zeligs has proposed, one could argue however, that Gould's name should only be associated with the original 'Improved Pocket Microscope' that he developed and described in his books. He never took credit for any of the larger varieties of similar microscopes, and it seems that although the majority of signed microscopes of Gould's original design are signed 'Cary, London,' the larger variations were sold by a wide variety of opticians and varied tremendously in their specific details of construction. The little 'Gould Improved Compound Pocket Microscope' however, seemed to evolve in a more restricted pattern, although as time went on, additional accessories (especially the special high power black disk and the associated test slide), were added. The table at the bottom of this page summarizes some of the publications depicting Gould's Pocket Microscope, especially volumes of Gould's book that I am aware of, and the differences as I have noted. It also lists changes in the contents of this kit. This is still a work in progress, hence not yet complete. I have also included the title page from the books I have had access to. The Gould book seems to have first been published from no later than 1826, until at least 1850, and includes at least seventeen editions, according to Brian Bracegirdle's book, although as one can see, I have not yet found all of them! As time passed, the little Gould microscope kit did change a bit, as did his books. If you would like to look at the title pages to compare one with another (that I have had access) to (starting with 1826), please click HERE. For a tabular summary, see the bottom of this page and for more information simply keep reading. CASE SIZE: Initially the outer dimensions of the case were 4 x 3 inches, but soon a slightly smaller 3.5 x 3 inches. In an engraving from the 1832 volume of The Naturalist (Boston), the dimensions appear to be 3 x 2 1/2 inches, but I have not seen one so small. On reviewing the actual measurments reported by fellow collectors as well as Dr Brian Bracegirdle in his catalogue of the Science Museum examples, it has been found that they actually vary quite a bit in outer dimensions. Relatively few measure the original 4 x 3 inches. The majority of surviving instruments average about 3.7 x 3.1 inches in outer dimension, compared to Gould's description of 3.5 X 3 inches. THE ARM: The arm, which initially slid in a slot or dovetail on top of the pillar (much like the Ellis Aquatic type microscope), by 1829 attached in a fixed position via a hand-tightened knob; a square peg secured the arm in these models preventing horizontal motion of the arm in any direction. Also note the stage on the earlier model attached to the pillar by a peg and could easily be removed, but on the later model a screw held it in place permanently. 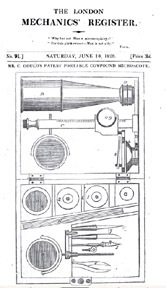 BULLSEYE CONDENSERS: On the occasion of the first publication about this microscope, in the London Mechanics' Register on June 10, 1826, the kit included a stage-mounted bullseye condenser; curiously this was never pictured, nor described, on any subsequent engraving in all the volumes of Gould's books from 1827 onwards. A few examples of a miniature stand-alone bench-type bullseye are known to have been included with a few of Gould's instruments, but only a few are known, so likely this was an 'extra' accessory supplied to order; this accessory was never mentioned nor pictured in any of Gould's books. STAGE CONFIGURATION: The stage, initially round with one flat side, soon took on a shape of a narrow rectangle tangent to a circle, but this change was never depicted in the engravings. 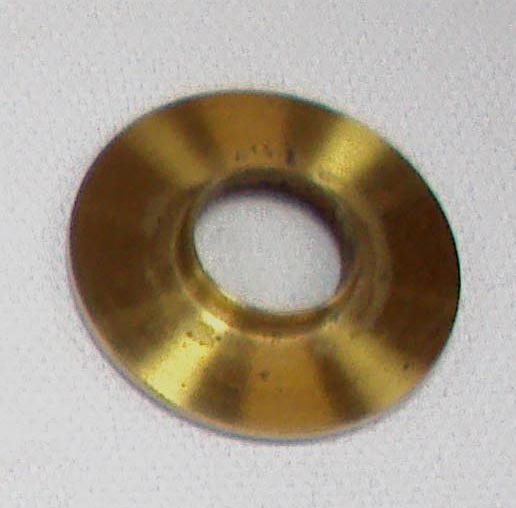 Usually a single hole was present on one side of the front of the stage, but examples are known with one hole on each side of the front. Additional uncommon configurations exist on a clear minority. BRUSH: Although the initial engraving did not picture a brush, it was described to be in the kit from 1826 in the descriptions of the plates showing the microscope packed in its case; by 1829 it was added to the engraving as well. This brush was not intended to be used to clean the optics as one might suppose, but rather to harvest insects like mites, according to Gould's books. The Gould livebox or 'object box' as he called it, was included from the first version of the microscope, and continued throughout its production. A deep round brass trough (he called a 'moveable piece'), not initally included, was added as was a small glass slide trough (the 'two pieces of glass sealed together for holding a drop of water'), both shown no later than 1829. The glass slide trough ('two pieces of glass...') simply consisted of two small glass slides sealed on three sides with red wax; this latter accessory was for viewing a very small specimen of e.g. pond water, retrieved via the tiny spoon to the handle-end of the brass forceps. Although this spoon was added by 1829, it is never seen in the engravings because it is on the handle-end of the tweezers, hidden under the cloth flap in the engravings. CHANGES IN OBJECTIVES: Even the optics changed over the years. In the initial engraving from 1826, there were five objectives in total. Two were pictured stored on the optical tube, two in the case separately. In addition there was a 'speculum' reflecting objective, similar to what was supplied with the Ellis-aquatic type microscopes previously; this was stored in the case by racking up the stage against the arm, with the reflector attached to the arm. This 'speculum' objective, (also known as a Lieberkuhn, after the famous microscopist who popularized it), was meant for observing opaque objects with a higher power and reflected illumination from below back down on the specimen; it was not mentioned nor pictured in subsequent years. By the 1827 edition of Gould's book, only three powers of objectives were present. 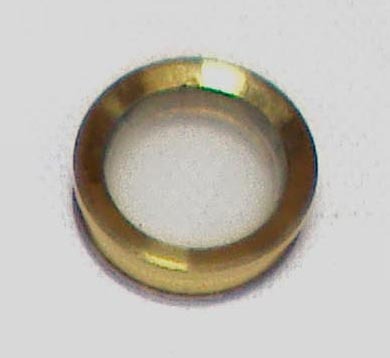 However, starting no later than with the 1835 10th edition, a special 1/30th inch focal length high power drop-in lens in a black brass disk was added (and pictured), along with a test slide (not pictured, but mentioned), to prove the authenticity of the high power objective. The text of the book was confusing, to say the least, when describing what was supposed to be seen on this test slide, but after reading the descriptions and examining the contents of these slides, the author has concluded it was the scales of Morpho menelaus, and specifically their cross striations. The confusion likely arose from several typographical errors in the initial pages describing the lens and the test object, and also in the legend to the plate of test objects. On perusing these books, typographical errors were quite plentiful. TALC BOX: A talc box, containing mica cover slips, similar to those found in microscope kits of the eighteenth century, was also pictured in the 1826 engraving, but its spot in the case was subsequently occupied by an objective by 1827. 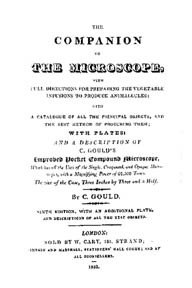 CHANGES IN THE TEXT: During the years between the origination of this microscope in the early 1820's, and the last edition of Gould's book in the 1850's, tremendous progress was made in the field of microscopy. As time went on, the title went on to reflect some of these changes as did some of the content. In 1827 Gould's book is one of the earliest to document the use of thin pieces of mica ('talc') to cover specimens in liquid. In that same edition he also said: 'you will find clear slips of glass preferable to talc.' The power of the objectives was also noted to be higher as the years went on: 'Three Hundred' in 1826, '6100 times' in 1827, '26,000' in 1829, '62,500' by 1835. Goring had proposed test objects in the early 1820's; a plate of test objects was added to Gould's book in 1835. 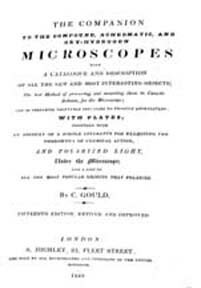 In 1836 the title included properties of chemicals under the microscope. By the 1848 (15th) edition, the method of mounting by using liquid Canada Balsam was included; its traditional use was first published by Griffith in 1843. In 1848 the use of polarized light was added to the book. Although this model of microscope never included achromatic objectives, Gould makes reference to better objectives and even achromatic objectives in other microscopes in the later editions of the book, mentioning that such higher quality instruments were available from the W. Cary company. Note however that the reference to the Cary company was removed from the title page of 1848. Coincidentally, the first book with the word 'Achromatic' in the title was the 1848 15th edition. For a transitional microscope incorporating older features but new achromatic lenses made by Cary, see here. The evolution of the contents of the kit may be partially viewed through the engravings shown here which, through the use of red arrows, show most of the additions and deletions. Thanks to Joe Zeligs for providing part of this illustration. Note that although the brush was included by description, it was not pictured in the original engravings, only to be added to the pictures later. Also note that since only the pointed end of the tweezers was shown, the addition of the spoon at the other end is not shown. In addition, note the test slide is not shown in the engravings. On another note, known examples, as is often the case with antique microscopes, show transitional features between the models as seen here. For instance, I am aware of a signed Cary example with most of the features of the earliest model, including the stage-mounted condenser, but the arm is attached to the pillar by the later type of knobbed screw. The components of this example appears to be authentic original Cary components, so I have little doubt this is a valid form; it is also possible that the stage-mounted bullseye condenser was offered as an extra accessory with the later models. As often is the case, the information contained herein is an effort of more than just the author, and the help of Joe Zeligs, James McCormick, and others is gratefully acknowledged. I would welcome additional information. Please contact me at Collector@microscope-antiques.com. 1826 LONDON MECHANICS REGISTER 7(+/-) MR. C. GOULD'S PATENT PORTABLE COMPOUND MICROSCOPE NA Had a Lieberkuhn plus four brass-celled objectives, a talc box, and stage-mounted bullseye condenser. 1829 (5) FIFTH 46 THE COMPANION TO TO THE MICROSCOPE WITH FULL DIRECTIONS FOR PREPARING THE VEGETABLE INFUSIONS TO PRODUCE ANIMALCULESWITH THE BEST METHOD OF PROCURING, AND A CATALOG OF ALL THE PRINCIPAL OBJECTS,WITH A CATALOG OF ALL THE PRINCIPAL OBJECTS, AND THE BEST METHOD OF PROCURING THEM; WITH PLATES AND A DESCRIPTION OF C. GOULD'S IMPROVED POCKET COMPOUND MICROSCOPE, Which has all the Uses of the Single, Compound, and Opaque Microscopes, with a Magnifying power of6100 26,000 Times. The size of the CaseFOUR INCHES BY THREE, Three Inches by Three and a Half. FIFTH EDITION, WITH ADDITIONS. LONDON: SOLD BY W. CARY 181 STRAND. PRINTED BY G. DAVIDSON, SERLE'S PLACE, CAREY STREET, 1829. G Davidson, Serle's Place, Carey Street Note that the line about catalog and procurement is virtually the same as the 1827 edition, but the wording is reversed. 1829 (6) SIXTH 50-52 THE COMPANION TO TO THE MICROSCOPE WITH FULL DIRECTIONS FOR PREPARING THE VEGETABLE INFUSIONS TO PRODUCE ANIMALCULES WITH A CATALOG OF ALL THE PRINCIPAL OBJECTS, AND THE BEST METHOD OF PROCURING THEM; WITH PLATES AND A DESCRIPTION OF C. GOULD'S IMPROVED POCKET COMPOUND MICROSCOPE, Which has all the Uses of the Single, Compound, and Opaque Microscopes, with a Magnifying power of 26,000 Times. The size of the Case Three Inches by Three and a Half. By C. GOULD. SIXTH EDITION, WITH ADDITIONS. LONDON: SOLD BY W. CARY 181 STRAND. PRINTED BY G. DAVIDSON, SERLE'S PLACE, CAREY STREET, 1829. G Davidson, Serle's Place, Carey Street By this time, the engraving showed the brush (always mentioned but not pictured in 1826-27); the glass trough was now supplied and pictured, as also now was the glass disk for the stage also pictured. Another new accessory was the deep round brass trough. The title is now identical that of the fifth edition except that the authorship of C. Gould is noted for the first time. Note the slight increase in claim of magnification. The engraving of the instrument in its box is very similar to the 1829 Engraving shown above, although not all the item labels can be seen in the copy available from my source; in the 'description of the plate' the wording is identical to Gould's except for the numbering assigned to the objectives as numbers 4,5 and 6 instead of 1,2, and 3, and also for the fact that the description of the dissecting instruments, and the spoon at the end of the forceps, are mentioned in the text of the 1829 version of Gould's book, but included in the 'description of the plate' in the article from the Naturalist. It is also of interest that the exact plate from Gould's book of 'A Microscopic View of a drop of Water' was also used in the second article about the Microscope in the Naturalist (page 224, plate 8); even the wording in the caption is exactly the same. #'d up to P. 65. 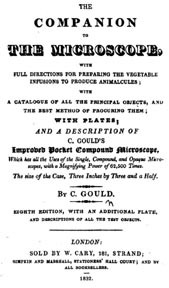 THE COMPANION TO THE COMPOUND OX-HYDROGEN AND SOLAR MICROSCOPES: WITH A CATALOGUE AND DESCRIPTION OF ALL THE NEW AND MOST INTERESTING OBJECTS, and best Method of procuring them; AND FOR PREPARING THE VEGETABLE INFUSIONS TO PRODUCE ANIMALCULES. 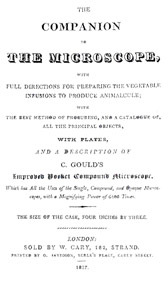 WITH PLATES; AND A DESCRIPTION OF C. GOULD'S Improved Pocket Compound Microscope, Which has all the Uses of the Single, Compound and Opaque Microscopes with a Magnifying Power of 62,500 Times. The size of the Case, Three Inches by Three and a Half. By C. GOULD. TENTH EDITION WITH AN ADDITIONAL PLATE AND DESCRIPTIONS OF ALL THE TEST OBJECTS. LONDON:, SOLD BY W. CARY, 181, STRAND;, SIMPKIN AND MARSHALL, STATIONERS' HALL COURT; AND BY ALL BOOKSELLERS. 1832. SIMPKIN AND MARSHALL, STATIONERS, HALL COURT High Power Black Disk Objective was supplied and pictured, Test Object slide supplied (but not pictured), and the book included a Plate of Test Objects, something newly added to the long title. There is some rearranging of the words after the words 'solar microscopes:' but the meaning is the same. The best Method of procuring them, AND OF PREPARING VEGETABLE INFUSIONS TO PRODUCE ANIMALCULES; and mounting them in Canada Balsam, for the Microscope; AND OF PREPARING VEGETABLE INFUSIONS TO PRODUCE ANIMALCULES. 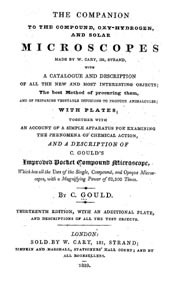 WITH PLATES TOGETHER WITH AN ACCOUNT OF A SIMPLE APPARATUS FOR EXAMINING THE PHENOMENA OF CHEMICAL ACTION, AND POLARIZED LIGHT Under the Microscope AND A LIST OF ALL THE MOST POPULAR OBJECTS THAT POLARIZE. 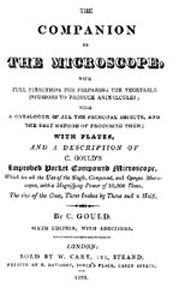 AND A DESCRIPTION OF C. GOULD'S Improved Pocket Compound Microscope, Which has all the Uses of the Single, Compound and Opaque Microscopes with a Magnifying Power of 62,500 Times. 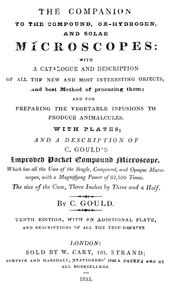 By C. GOULD FIFTEENTH EDITION WITH AN ADDITIONAL PLATE AND DESCRIPTIONS OF ALL THE TEST OBJECTS REVISED AND IMPROVED. LONDON: SOLD BY W. CARY 181, STRAND; SIMPKIN AND MARSHALL STATIONERS' HALL COURT; S. HIGHLEY, 32, FLEET STREET, AND SOLD BY ALL BOOKSELLERS AND OPTICIANS IN THE UNITED KINGDOM., 1848 --?-- Note that the reference to Cary is completely removed, Canada Balsam as a mountant is now in the title, and polarized light objects are also added to the title, and Gould's own microscope, though described and still pictured inside, is also deleted from the title. Furthermore, Samuel Highley's name and address replace Cary's though it does not state 'Sold by' like it did for Cary.